Along with brilliantly colored leaves and cooling weather, nothing signifies the Fall season like the start of a new school year! Forever 18 Inches has created a classic schoolgirl skirt for the occasion, with a design that's timeless enough to be historically accurate from the 1940s to today. Change the top and accessories that pair with the skirt, and change the era! This skirt pattern is a quick-sewing project that uses a very easy, non-standard method to mark and create the pleats that define this skirt. If you hate chalk and marking pens, this pattern is for you! Three options are included for different looks: front and back pleats with a faux-buttoned front placket, suspenders for a Swing-era look, and a simplified variation that eliminates the back pleats and placket. All options include a waistband with a flat front and elasticized back for a universal fit. This PDF sewing pattern is designed to fit 13-14.5 inch dolls such as Hearts For Hearts Girls®, Petitecollin® Minouche dolls and WellieWishers™. 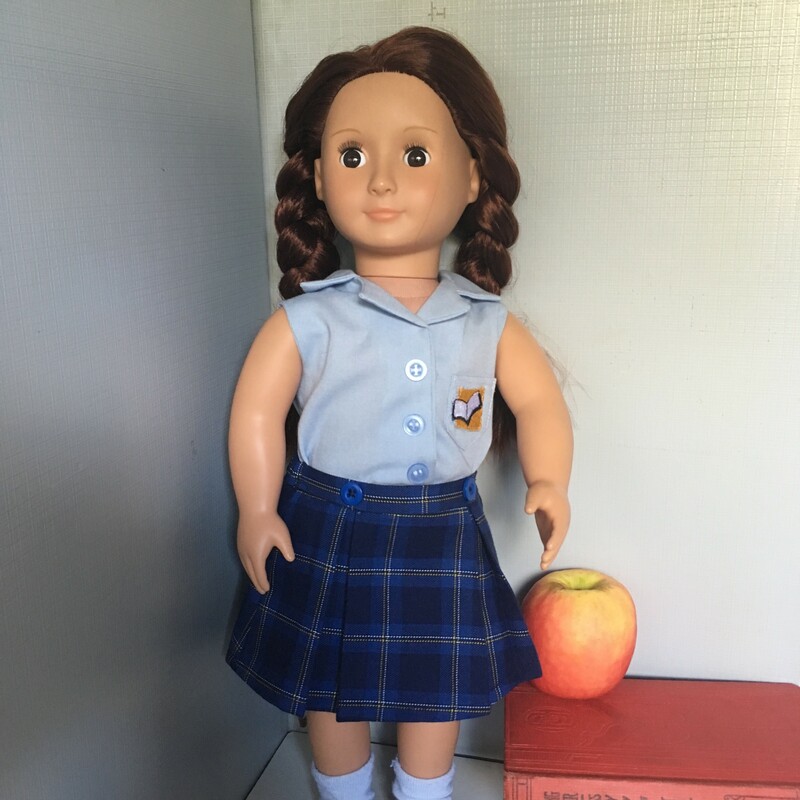 It is also available on Pixie Faire for 18" dolls such as American Girl®. Pair this Schoolgirl Skirt with the Forever 18 Inches Classic Cardigan to create a one of a kind ensemble! PixieFaire and the designers featured are not affiliated with Hearts For Hearts® or WellieWishers™. This pattern is well worth the purchase. It is easy to sew and incredibly versatile. I already have more planned. I didn't use the new suggested pleating method, but I will keep it in mind for the future. Recommended!!! Love this pattern and hope to make more! Adorable pattern. Directions and pictures are perfect as usual.